Gallup will probably see a reduction in snaps following the acquisition of Amari Cooper. Gallup played 56 of 66 snaps (85 percent) on offense during his career-best performance in Sunday's 20-17 loss to Washington. Gallup caught three of five targets for 81 yards and a touchdown during Sunday's 20-17 loss to the Redskins. Gallup caught one of two targets for 27 yards in Sunday's win over the Jaguars. 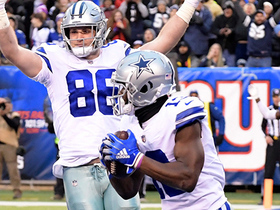 Analysis: Amazingly, those numbers made him the Cowboys' second-most productive wide receiver on a day when the team scored 40 points. 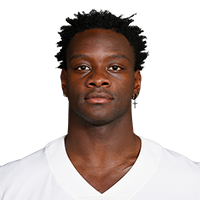 Gallup has hauled in only seven of 17 targets for 109 yards through the first six games of his NFL career, and while his snaps could increase if Tavon Austin (groin) misses significant time, the rookie's production likely won't rise to fantasy relevance any time soon. Gallup caught one of three targets for six yards during Sunday's 19-16 loss to the Texans. Analysis: Gallup made some headway in Week 4 against Detroit, primarily thanks to a 37-yard completion. There were no big plays to be found in Houston. Week 4 aside, Gallup has caught just one pass per game and has been held under 10 yards thrice. Jacksonville's top-five pass defense, which Gallup will see Sunday, seems an unlikely opponent to have a breakout game against. Gallup caught two of five targets for 45 yards during Sunday's 26-24 win over the Lions. Gallup caught one of four targets for 17 yards during Sunday's 24-13 loss to Seattle. Gallup was targeted twice and came away with a five-yard reception during Sunday's 20-13 win over the Giants. 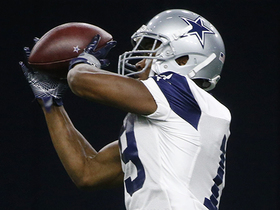 Analysis: That makes two games and just two catches for the rookie third-round pick. He and Dak Prescott just missed each other in downfield moments before halftime, but he has otherwise been limited to few underneath completions. 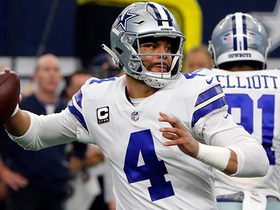 The Cowboys still seem to be sorting things out with their passing game, but until strides are made from what is currently the league's 31st-ranked passing attack, interest in a bottom-of-the-depth-chart target like Gallup should be kept to a minimum. Gallup caught his only target for nine yards in Sunday's loss to the Panthers. 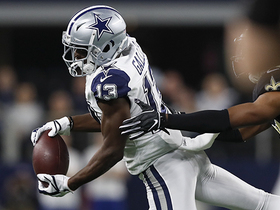 Analysis: After creating some buzz with an impressive TD catch early in the preseason, Gallup's actual NFL debut was something of a bust, though the entire Cowboys passing game struggled in the loss. Until the team shows an ability to move the ball downfield consistently, its receivers will be risky fantasy plays -- Gallup included. Gallup caught four of six targets for 29 yards in Thursday's preseason finale against Houston. Gallup failed to haul in either of his two targets in Sunday's 27-3 preseason loss to the Cardinals. Analysis: Gallup's first target was a deep ball, which he failed to come down with while being defended by star cornerback Patrick Peterson. The rookie was later thrown to in the end zone on what turned into an interception. While the Colorado State product is dripping with big-play ability, he was unable to showcase it here against Arizona's starters. It's important to note that starting quarterback Dak Prescott didn't play, thus limiting both Gallup and the Dallas offense as a whole. 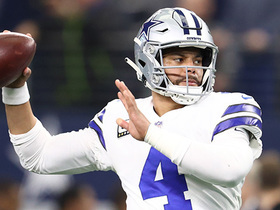 Cowboys owner Jerry Jones expects Gallup to have an immediate role on offense, Kate Hairopoulos of The Dallas Morning News reports. 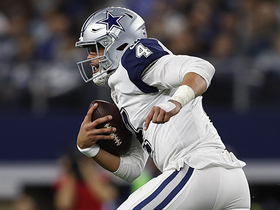 "[Gallup]'s working toward consistency, confidence with his quarterback, all of those things," Jones said. "I think he's going to start off. Opening day, he'll be part of our plan." Gallup caught one pass on three targets for a 30-yard touchdown in Thursday's preseason game against the 49ers. 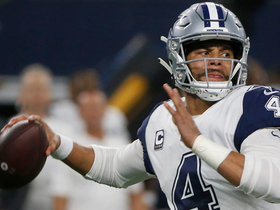 Analysis: He hooked up with Dak Prescott for the score on the Cowboys' first drive of the game, as Gallup simply beat Jimmie Ward on a go route down the sideline. The rookie has been seeing reps on the first-team offense in camp with Terrance Williams (foot) not yet 100 percent, and if Gallup continues flashing this kind of chemistry with Prescott, his fantasy stock will only rise. Gallup has received some reps with the first-team offense in practice during the early part of training camp, Brandon George of The Dallas Morning News reports. 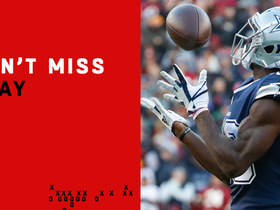 Analysis: That says as much about the state of the Cowboys' depth chart at wide receiver as it does about Gallup's development, but the 2018 third-round pick has shown some early flashes of ability already, using his impressive wingspan to high-point passes in traffic. 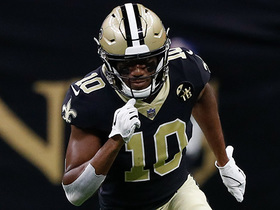 The rookie will need to continue improving and show more consistency if he's going to have a significant role this season, but so far Gallup appears to be on the right track. 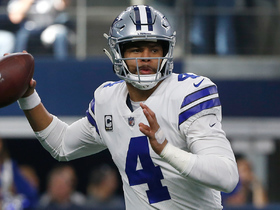 Cowboys offensive coordinator Scott Linehan believes Gallup can make an impact in the red zone, NFL.com's Gregg Rosenthal reports.